Arsenal Manager Unai Emery has instruct Mesut Ozil to give more to the team and also help his team-mates in carrying out defensive duties. Arsenal lost their first match of the season against Manchester City last Sunday and they will look to put up a better performance this Saturday when they take on Chelsea at Stamford Bridge. 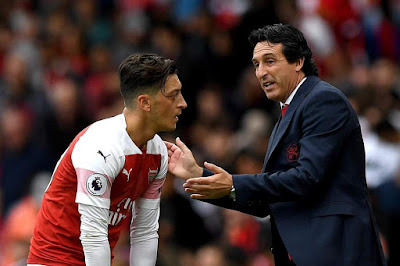 Mesut Ozil did not have the best game against Manchester City and Arsenal Boss Unai Emery wants him to do more in the game against Chelsea. He has now charge the German international to help the team in both defending and attacking and also give his best. Arsenal will play Chelsea later this evening and they will try all they can to get a win. What's your prediction for the game between Arsenal and Chelsea?